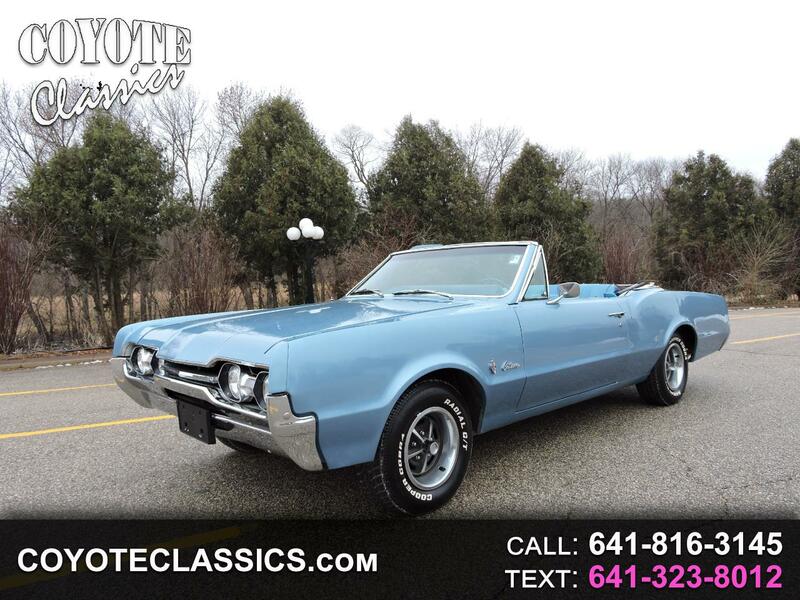 If you are looking for a nice driver/project condition 1967 Oldsmobile Cutlass Convertible this may be it! It is powered by a 350 4bb V8 engine, and backed up by an automatic transmission. It comes equipped with power steering, power brakes, dual exhaust, power top, and is riding on a nice set of rally rims with RWL tires. The previous owner installed a brand new wiring harness, new white top, and a new light blue interior were all installed in the last few years. He used this as a fun cruise night and parade car and looks good at 20 foot. Up close you can see that the light blue paint needs to be repainted, it has paint flaws and needs some blocking. Its seems to be a good solid car with a amateur paint job, and a nice looking interior. This car has a nice stance and look. Message: Thought you might be interested in this 1967 Oldsmobile Cutlass.